Write as you normally would. Use the built in headings to correspond exactly to h1, h2, h3 header tags in WordPress. Bold, italics, bullets, images, even tables, no problem. Plus you can comment, track changes, and use Google Docs to collaborate — Wordable doesn’t care. You’ll see all your Google Docs in Wordable. You don’t even have to search for it, we’ll show you the last 10 files you edited automatically. Choose to export as a post or a page and let Wordable work its magic. Click through to WordPress and check out your post. Make any final adjustments you want and hit publish. 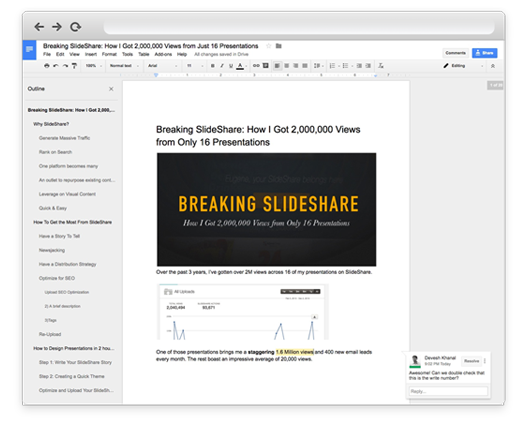 Your team can collaborate in Google Docs and you can save hours importing into WordPress. Forget the pages of instructions asking contributors to format posts in Word and save images in a folder. Import in one click. Your time is precious, spend it writing and promoting content, not importing and formatting. We use Wordable to push all of our guest posts from Google Docs to WordPress. Love it. (The worst thing ever was trying to get images out of Google Docs). Before Wordable, the only fail-safe way I had to get my articles properly formatted into WordPress took ~1-2 hours. Wordable does it in 5 seconds. If you’re not 100% satisfied, let us know in the first 30-days for a full refund. Aren’t finding the answers your looking for? Email Us. 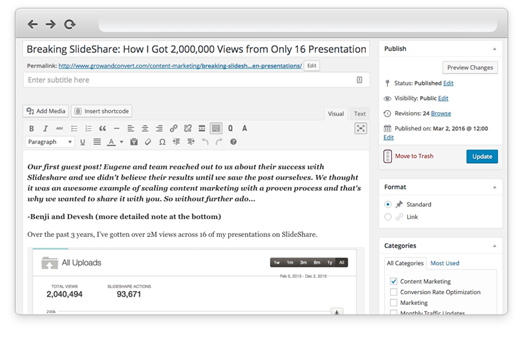 Wordable is a tool that instantly exports your Google Doc to a WordPress post or page. Raw HTML, Headings, Images, Tables from your Google Doc are all imported. Google Docs are imported as drafts for you to make any final adjustments, schedule and publish. Wordable was created out of personal frustration spending hours copy/pasting from Google Docs into WordPress and ugg, uploading all those images. There has to be a better way – hence Wordable was born. Yes, you may connect one WordPress site and export 3 documents to see the magic of Wordable. Click here to try for free now. Where can I go to find out more, talk to someone or get a reference? Please email us at support@wordable.io and we’ll be happy to set up a call with us and/or arrange to talk to one of our customers. You can also check out our 50+, 5 star reviews on Capterra. Anyone who values their time. Time yourself copy/pasting a Google Doc into WordPress, importing the images and reformatting the post. Then you’ll know there must be a better, faster way and there is…yup you guessed it – it’s Wordable. How do I connect Wordable my WordPress site? 2. Connect using your WordPress admin username and password. How many WordPress sites can I connect to? As many as you’d like with our monthly or annual subscription plans. Do you work with Google Team Drives? Not at this time, but we’re working on it. Drop us an email and we’ll let you know when it’s live. Can I transfer my account to another email address? Yes, email support@wordable.io and we’ll transfer it over for you. Do you have an account for teams? Ie. Can I have multiple writers connect to one Wordable account? Not at this time, it’s on our development radar but we don’t have that feature yet. Please email us at support@wordable.io to discuss options for you. Does Wordable work with anything besides Google Docs? 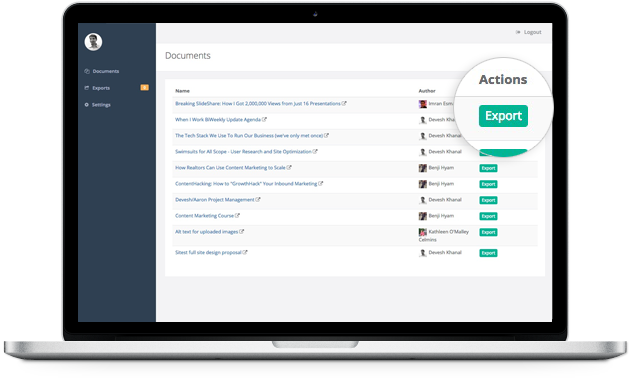 Word, PDFs, Quip? No, at this time Wordable only works with Google Docs. What’s the maximum image file size that Wordable will handle? We limit exported images to less than 2MB, in order to ensure your WordPress install accepts the upload. Do you guys support H4, H5, H6? No, we only support H1, H2, H3. Does Wordable support HTML tables? Does Wordable support tab formatting? Does Wordable support table of contents links? I can’t get my WordPress site to connect? Please email us and we will work with you to connect your WordPress sites. Its possible you have a plugin that is blocking our connection via XML-RPC. If you have one of these plugins installed please let us know which one and we’ll work with you: 6Scan Security, Acunetix WP SecurityScan, All In One WP Security & Firewall, Cerber Security and Antispam, iThemes Security (formerly Better WP Security), Ninja Firewall, and BulletProof Security Sucuri Security, WordFence.